Today was the annual Breakfast with the Bunny at church. I actually had to get the kids up early, because neither of them are usually up at kicking at 9am. Breakfast was scrambled eggs, bacon and/or sausage and pancakes, but let's face it, kids don't care that much about the breakfast part. It's the Easter Bunny they want to see! 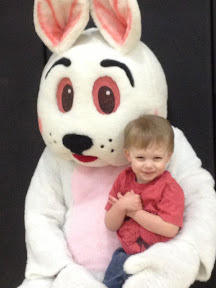 I didn't get pictures of Scarlett by herself or the two of them together with the Bunny because I was trying to get her to smile for the photographer. As usual, though, she was happy on his lap and didn't want to let go when I tried to get her back! 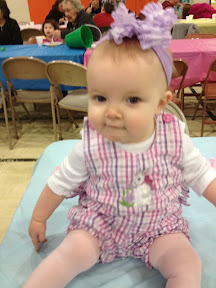 She looked SO sweet in her little outfit, though. 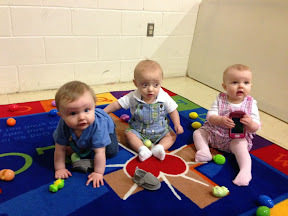 After the Easter Bunny, we had our Easter egg hunt. We do it in the dark gym with flashlights! Since we have so many babies, I came up with the idea to get a rug from the nursery for the babies and to lay some eggs out on it. Turned out to be a great idea! 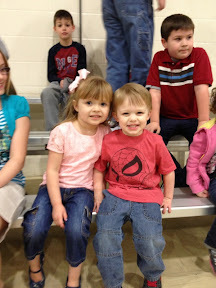 We had a great day with the Easter Bunny and our friends. A Freebie and a Giveaway!